So, back to what I promised, and that is some more glorious non-fiction for you! I’m a little late to the party with these two books, but I do think they are completely worth the wait. Flying Eye books are a publisher who have a certain style to their work. Their publications scream quality, with a distinctive retro styling that I have always really rather loved. Their non-fiction books are eye catching and appealing for children with a look that begs to be read. I’m going to look at two of Flying Eye’s recent animal themed releases today. 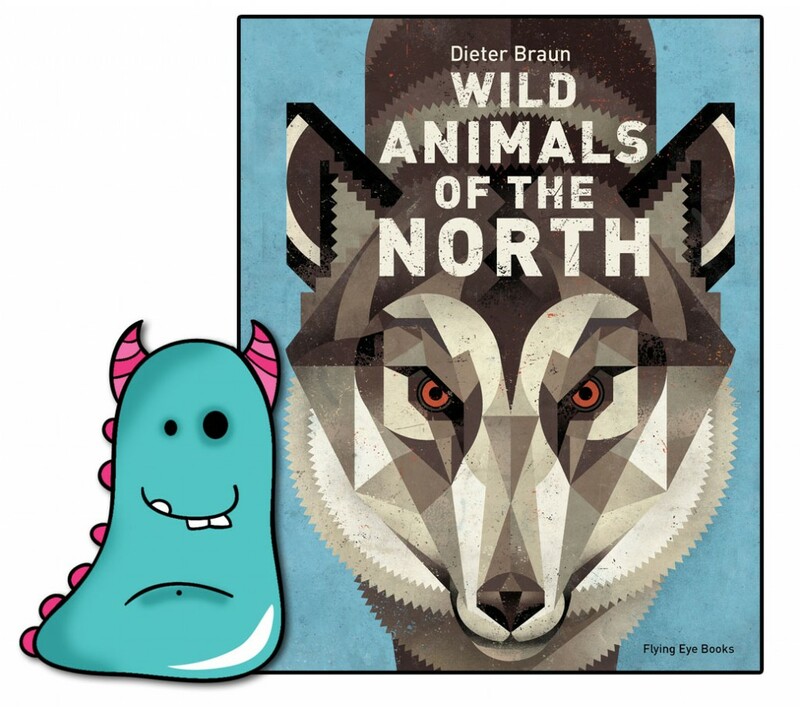 Wild Animals of the North has been written and illustrated by Dieter Braun and published by Flying Eye Books. This book caught my eye the moment it started doing the rounds on social media, and was one book I had to purchase for myself. 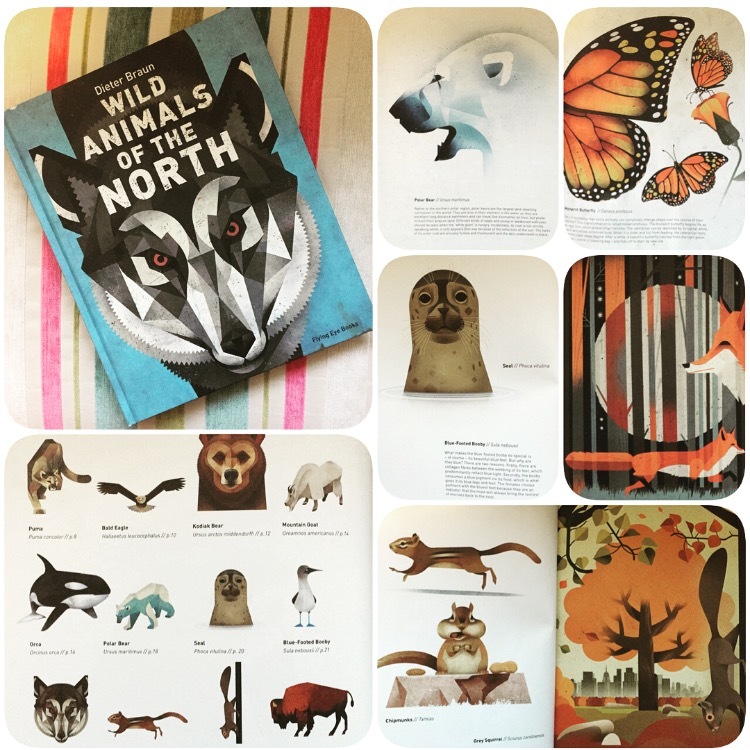 Wild Animals of the North is exactly what it states, an encyclopedia of animals covering the northern hemisphere. So we are taken on a journey through North America, Europe and Asia looking at the incredibly diverse species of animal. Each page covers one animal, with numerous illustrations and a small perfectly formed and informative snippet of information about them. The front cover of this book portraying the wolf upon a grungy blue background is truly captivating and representative of all the incredible illustrations within this book. And this is what, I think, makes this book so unique. Braun’s geometric style illustrations are incredibly precise and yet they capture the very essence of each animal covered in the books. They eyes on each animal are actually quite simply done but somehow Dieter Braun has been able to show expression and character in every one. It’s really incredible. Every page a work of art, while also representing the animals in a clear way for children to recognise and identify! It doesn’t matter how many times I journey through this book I never fail to fall in love with each illustration. I genuinely struggled to choose which page spreads to photograph for this collage. So Wild Animals of the North is clearly a beautiful feast for the eyes, no doubt about that, but it’s also interesting. As mentioned before, each page we are given an animal, their latin name and then a brief paragraph of information. In a children’s book it’s not always feasible to cover all information about animals, so here each paragraph contains the most interesting facts about the animals. This varies from unusual mating rituals, habitats or hunting behaviour. Things children will find interesting and engaging and just enough for them. I really can’t speak highly enough of this fascinating yet beautifully designed book. This is what non-fiction should be about. Wild Animals of the North is available from all good bookshops and libraries now, while Wild Animals of the South is due out in March 2017 and is most certainly one to look out for! 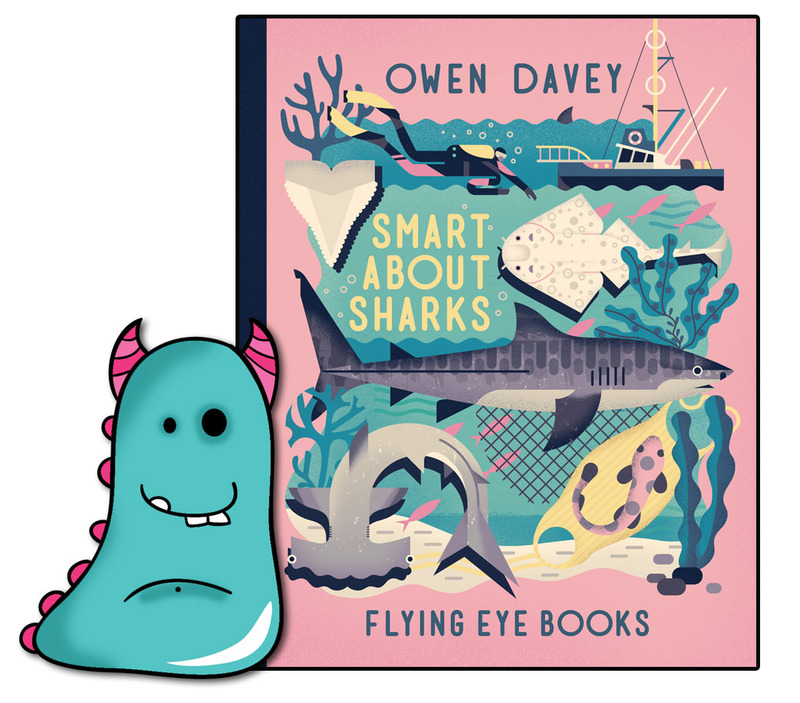 To follow I have Smart About Sharks written and illustrated by Owen Davey and again published by Flying Eye Books. The striking thing about this book is the cover design, honestly, it’s a beautiful thing! 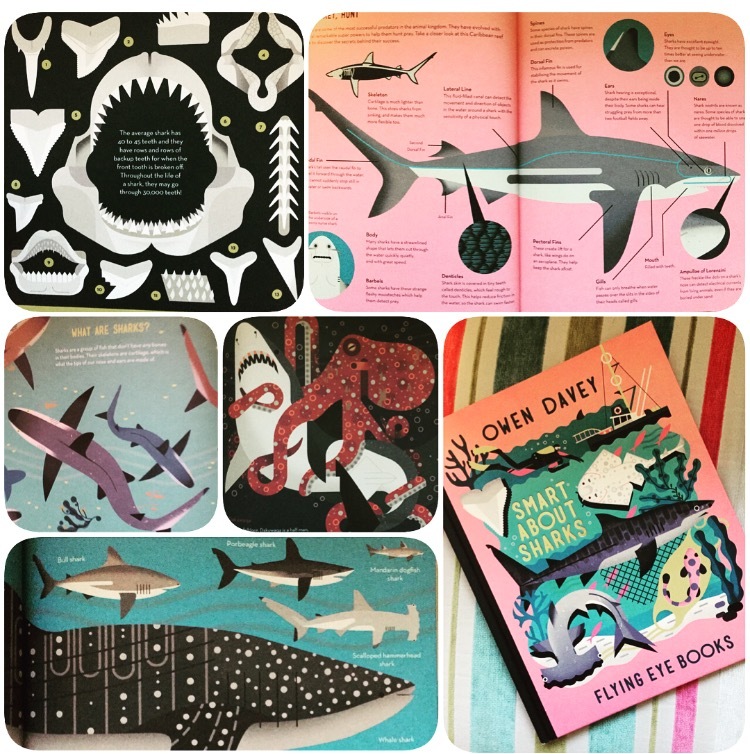 With a bright pink background, which is probably the very last colour you would think of putting on a shark book, it stands out, is appealing and bright. I love it! The contrast of a book containing one of our most feared animals, the shark, on a pink background! It works SO well! The title is gold foiled and indented which looks glorious as it catches the light, and again we have retro style illustrations that fill the rest of the cover! It’s quality, it’s exactly what a child will want to pick up and want to read! It’s brilliantly engaging, pitched at the right level to inspire children. The writing continues in the same vein. Each section is clear and concise, contains only the informative or interesting, and no extraneous waffle. We are taken on a journey, looking through all the different species of shark, of which I had no idea there were so many! Looking at their hunting rituals, features, teeth, mythology, differing sizes and even social life! Adults will learn along with children here, it’s all fascinating stuff and fantastic promotion of this much undervalued yet brilliant creature. Owen Davey’s illustrations really pack a punch in this book. His style is clean and simple, but with enough detail to distinguish each shark and liven up the pages. Every page is totally different, packed full of relevant and interesting images, but the book hangs together brilliantly as a whole too. There is just the right combination of the ferocious side of sharks that children will just love, but also the nicer side of these glorious animals. I can see children relishing reading through this book time and time again! Smart About Sharks is available now from all good bookshops and libraries. So there you have it. 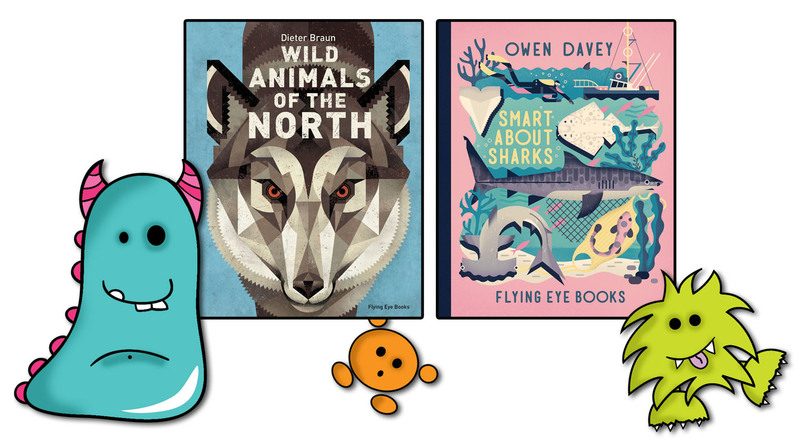 Two incredible animal based non-fiction titles that will surely engage and excite your children and you too! Perfect for reading for fun, for children who just love to read factual books, of which there are many, or as fantastic homework support.